JillianFae is an avid reader, writer, baker, cook, and dreams of becomming a world traveler. Paw Patrol is a relatively new show, airing on Nick Jr. It follows a young boy and his group of six pups as they use their skills and smarts to keep their town safe and happy. So, this past Christmas, and recently, for Nolan's fourth birthday, I tried my hardest to find him the Paw Patrol toys, which were number one on his list both times. First I tried all the typical retail websites, like Walmart, Target, KMart, Toys R Us, etc. Finding almost nothing, I had moved to in-store, but didn't fare much better there either. As a last ditch effort, I checked out amazon, figuring that with free shipping from my Prime membership it wouldn't be that bad...Boy, was I wrong. One of the toys in particular, a gray dog named Rocky that drives a recycling truck and practices environmentally friendly ways, was selling for well over $100. Yes, $100, that is sadly not a joke. Can't I buy this toy in my local store for $12.99? Sure, when they have them in stock, which hasn't been since October. So, I decided to bite the bullet on a few of the toys, since he really wanted to have all six dogs. I certainly didn't pay over a hundred bucks, but I did pay $25 for three of the pups with badges, that did not come with their cars. They arrived in a box, and when I opened it they were individually wrapped, and the plastic wrapping reminded me of something a happy meal toy would come in. Wow...that's a lot of money for a few cheap toys. But, he loves them and they made him happy, so I guess it was money well spent. I would've been much angrier if I had spent more, and would definitely think twice before doing it again. But, if you have a child that absolutely loves Paw Patrol, I highly recommend the three pack. The dogs are slightly smaller than the ones that come with the cars, but in comparison, $25 for three pups as opposed to $80+ is a pretty good deal. Unfortunately, it looks like the prices won't be going down, at least not until the company, Spin Master, manufactures more. There are times, usually in the early morning hours for only an hour or so, where you can buy the pups with their cars for their original MSRP on amazon of $12.99, but they sell out within minutes. My advice? 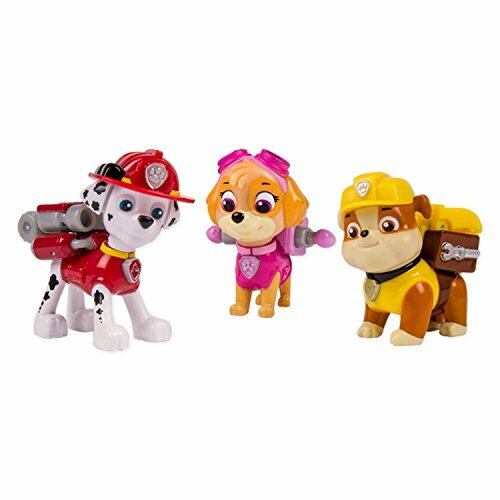 If you need a Paw Patrol gift in a month or less, go with the set I got, which is down below for around $25. If you have the time to invest in hunting around on the site for a few weeks at different times, wait to try and get one of the pups that come with their vehicles for around $13. And cross your fingers that Spin Master will make some more of these darn toys.